Crush mint leaves and sugar in a 12-ounce glass. Fill with crushed ice and whiskey. Stir until glass frosts. Decorate with mint sprig. Combine ingredients in blender; add ice cubes and liquefy. Add all ingredients in blender. Add milk to desired thickness. Put strawberries and pineapple in punch bowl. Add ginger ale and mix well; add ice. Add the champagne at serving time. Tie 1 T. whole cloves and 1 T. whole spice in cheesecloth; add to cider mixture along with 2 t. ground nutmeg. Cover; bring to boil, then simmer about 20 minutes. Discard spice bag. Great when served hot with a cinnamon stick in each mug. Sprinkle 2 cups sugar over fruit; let stand for 2 hours. Lay on top of fruit and sugar mixture. Pour 1 gallon boiling water over spices and fruit; let steep 10 minutes. Be sure to dissolve sugar and strain. Mix the yeast with the warm water. Stir sugar into thawed juice thoroughly. Add yeast mixture to juice and pour into jug. Fill jug the rest of the way with warm water within an inch of the top. Fasten balloon to top of jug. Set in dark, cool place for about 5 weeks. When all the air leaves the balloon, wine is ready to serve. Beat eggs in bowl; add sugar and salt, stirring until blended. Add milk and vanilla to egg mixture, stirring. Pour into glasses and sprinkle with nutmeg. Combine ingredients in large crock pot and heat at low temperature for three hours. Serve hot. Mix all ingredients together and put into airtight container. Three level teaspoons will make a warm cup of tea. Blend together in a blender and fill jugs; freeze. When ready to serve, thaw and serve as a slush. Pour punch over ice cream that is softened and serve. Steep tea bags in boiling water for 10 – 15 minutes. Remove bags and add sugar. Add frozen juices and let dissolve. Add enough cold water to make one gallon. 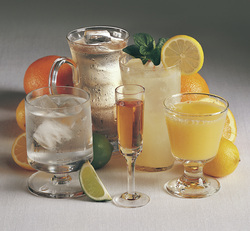 Click here to submit your drink recipe.